A new analysis of the extraordinary heat that affected the Arctic in 2016 finds that it could not have happened without the steep increases in greenhouse gas concentrations caused by human activity, and resulting loss of sea ice, over the past 150 years. Evaluating ocean and atmospheric observations with advanced modeling tools, scientists from NOAA and CIRES found that about 60 percent of 2016’s record warmth was caused by record-low sea ice observed that year, and the ensuing transfer of ocean heat to the atmosphere across wide expanses of ice-free or barely frozen Arctic Ocean. 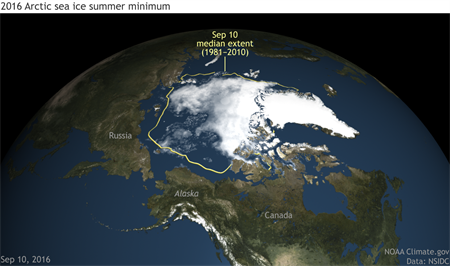 However, Arctic sea ice loss alone was insufficient to explain the totality of record warmth, the researchers said. Influences from outside the Arctic– such as the 2015-16 El Niño and remarkable intrusions of warm air that originated from outside the Arctic Circle - were also factors causing the 2016 extreme warmth. The research team concluded that there was near-zero probability that the Arctic would be as warm as it was in 2016 if greenhouse gas concentrations, ocean temperatures and sea ice were at late 19th Century levels. The new research appears online in the journal Weather and Climate Extremes. Long-term measurements have shown for many years that the Arctic is warming twice as fast as rest of planet, a phenomenon known as Arctic Amplification. One key component is the loss in sea ice. Ice and snow cover reflect sunlight, while dark ocean water absorbs heat. Thick ice prevents ocean water from transferring heat to the atmosphere, but open water - and even thin ice - allow massive transfers of heat to the air, which then retards the re-formation of autumn ice in a self-reinforcing cycle. Much of the Arctic sea ice is now only a year-old and thus thin, with few areas having multi-year thick ice. 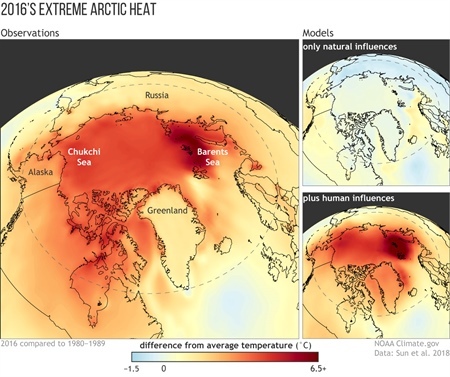 To evaluate the role global warming played in this extraordinary heat event, lead author Lantao Sun, a CIRES scientist working at NOAA, employed a widely used weather forecast model in an effort to resolve the sensitivity of the Arctic climate to various drivers, such as greenhouse gas levels, sea surface temperatures, sea ice extent, and other parameters. They found the model was able to replicate 40 years of actual Arctic temperature observations with a high degree of skill, including a striking upward trend. The record warmth of 2016 comes on the heels of a sequence of increasingly warm years in the Arctic, a situation realistically replicated in their model. To further explore which factors contributed to the record temperatures, they ran the same model, but constrained greenhouse gas levels, sea surface temperatures and sea ice extent, to levels that typified the late 1800s. This so-called “counterfactual” set of model runs helped test whether the record temperatures of 2016 could possibly be within the range of natural variability. As a glimpse to the future, the study also projected that the extraordinary temperature anomalies of 2016 will likely become the typical annual surface temperature within a mere decade. Further, by the middle of the 21st century, the deviation between temperatures of the “old Arctic” and 2016 are expected to double again as more and more sea ice is lost, Sun said.